Here's a fast fact about the youngest presidential candidate, and I mean really fast: Marco Rubio and his wife Jeanette have received 17 traffic tickets between the two of them since 1997. It seems that Rubio and Jeanette have a need for speed, but does his inability to follow the law of the land mean that he would be an ineffective president? The New York Times searched the Miami-Dade and Duval County court dockets, turning up four violations for Rubio and a whopping 13 for Jeanette since 1997. It's nothing particularly juicy, mostly rampant speeding, running red lights and reckless driving. But it was prolific enough for both of them to have been threatened with a suspension. 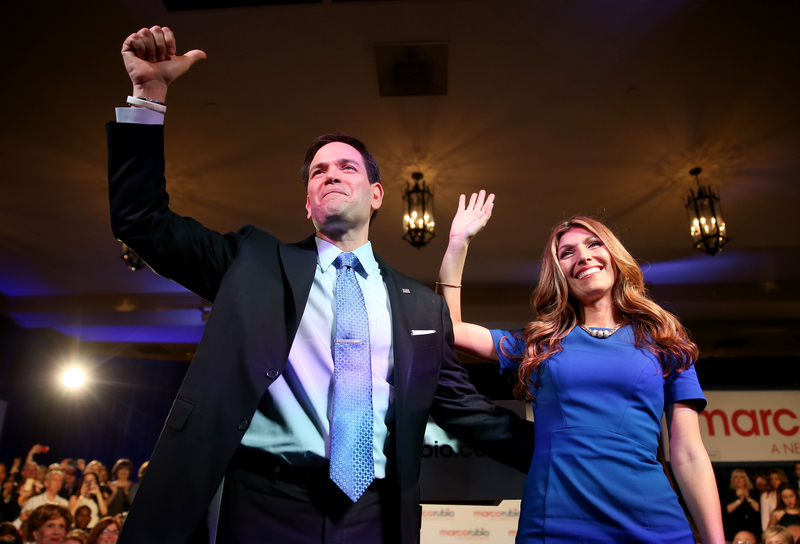 Rubio has faced license suspension once, and Jeanette has faced it three times already. Over the years the Rubios have paid out over $1,000 fighting traffic tickets, according to The New York Times. Rubio finally hired lawyer Alex Hanna, who specializes in traffic violations. Hanna seems to be more like one of those lawyers that you see on a billboard rather than one that represents politicians. From his site: "Arrested for DUI? Arrested for Leaving the Scene? Driving with a Suspended License? Arrested for a Drug Charge? Call Alex Hanna Now!" And, a very useful sales pitch to the Rubios: "Have you received a traffic ticket? Don’t pay it." Hanna has gotten the Rubios out of the candidate's last two violations and seven of Jeanette's last eight, which I'm guessing is a higher success rate than for most lawyers who serve politicians. Rubio had no comment on the matter(s!) to The New York Times. To be fair to the Rubios, the National Motorists Association lists Florida as the most likely state for people to get ticketed. But still, how does a seemingly flagrant disregard for the rules of the road translate to the White House? Does it actually matter if Marco "Lead Foot" Rubio sits in the White House with his Speed Queen as FLOTUS? No, probably not. Thankfully, the pair would have drivers if they moved into the White House, which could ease the minds of the poor citizens of Florida. The roads are safe again, people! But the president doesn't drive himself, well, anywhere, so in all likelihood, the Rubios penchant for speeding wouldn't really affect anything at all. Other than if this is all some crazy rage thing, they should probably look for a new outlet.